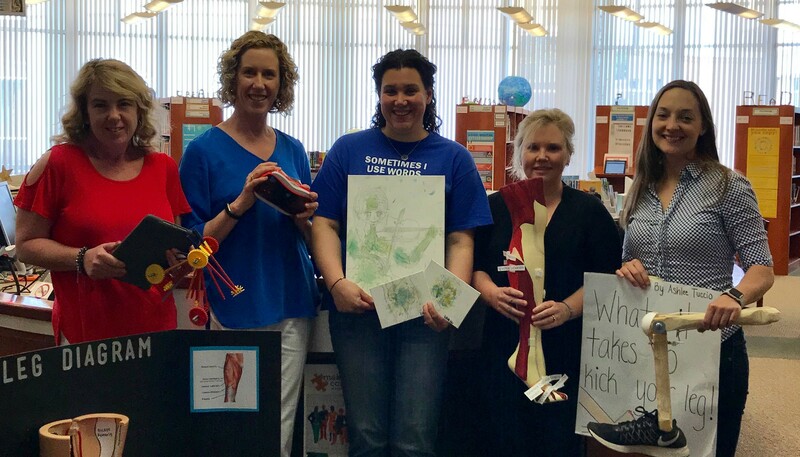 The collaborative team from Scotts Ridge Middle School includes (L to R): Emily Shiller, library assistant; Janine Johnson, library media specialist; Charlsie Vanderrest, 7th-grade science teacher; Kim Moran, technology integrator; Kelly Hall, 7th-grade science teacher. Since arriving at Scotts Ridge Middle School five years ago, I have had the pleasure of working with many of the passionate and talented teachers in our building. What was once a quiet library has become a bustling center of creativity and innovation. We are encouraged by administrators who support risk taking and believe in our Library Learning Commons as a center of learning and creativity. In spring 2017, our team – seventh-grade science teachers Charlsie Vanderrest and Kelly Hall; my amazing assistant Emily Shiller; and tech integrator Kim Moran — worked for the better part of the fourth quarter on a truly collaborative, personalized unit. Anticipating the shift in practice to phenomenon-based exploration and the Next Generation Science Standards (NGSS), our team worked together on an exploratory unit that would charge students with explaining how the six body systems (muscular, skeletal, circulatory, respiratory, digestive, and nervous) provide the energy for an activity of their choice, whether kicking a soccer ball, playing a viola, singing, or petting a dog. Planning began well before the fourth quarter. We shared a Google Drive folder and project plan and collaborated on a Google Site pathfinder. Reflection was an important formative assessment component of the unit, so rather than using Google Docs, we asked students to take notes and write reflections in composition notebooks. We agreed that the students’ end products must be complex, depicting how the body accomplishes the chosen phenomenon in a multimodal format. That is, their final product could not be a simple Google Slide presentation. Instead their final project should combine textual, aural, linguistic, and/or visual modes of communicating. Students generated their own questions and managed their research individually utilizing the Question Formulation Technique from the Right Question Institute. 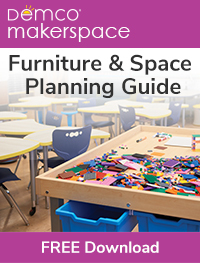 This marries well with NGSS, AASL’s Standards, and Guided Inquiry Design (focusing on “third space” connections) in order to heighten engagement and understanding. The driving question posed to students was: “What is happening inside the body that allows it to obtain and utilize energy?” Before students began exploring, they were shown a video montage of various human body activities, including sports feats, instrumental and vocal performances, gymnastics moves, dancing, and video gaming. The idea was to show them the range of activities the human body accomplishes while potentially piquing personal interests. Ample time was allocated for initial exploring, including the first day when students created a model showing their current thinking in response to the driving question (we returned to these later). 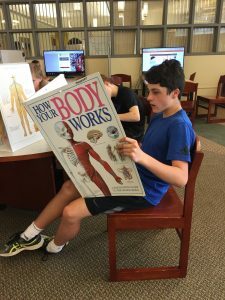 Students rotated in groups through “sandbox activities” spread throughout the LLC; these sandbox activities included traveling through the human body using virtual reality, visiting websites with 3D images, manipulating 3D models, and exploring games and giant books. To support student research, I curated diverse resources using Symbaloo, including everything from print and interactive e-books to open educational resources such as Biodigital Human and Innerbody. Lessons included web searching tips in which we used dry erase tables to develop, share, and reflect on key word choices; creating proper citations in NoodleTools; searching databases; and using advanced search filters. Our team used the sharing functions in NoodleTools to check in on and assess student research. As students progressed through their research and on to the creation stage, we shared some options with them. Technology resources, apps, and programs were linked from our pathfinder, and Kim provided lessons based on programs of interest, such as WeVideo for movie editing. Intrigued by Wiki Edu at the college level, I offered students the option to create a mock Wikipedia entry using old Google Sites. 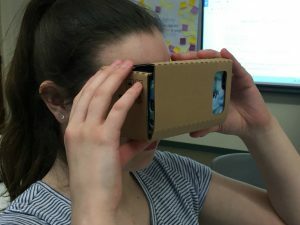 As part of a previous grant I explored virtual reality as an engagement tool. 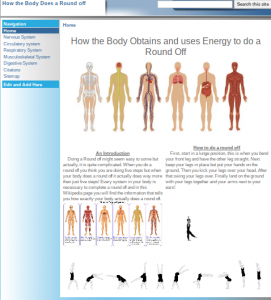 From this experience we worked with students who created 360° analogies of the human body using Storyspheres. Some students worked with our Little Bits or Legos to create models showing how the systems work together. Others chose to create movies using either WeVideo or iMovie, and many checked out iPads in order to record with a green screen and the Do Ink app. 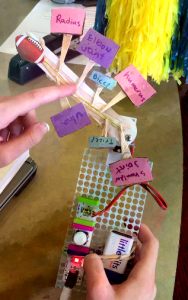 In the end, the variety of projects was extensive and included 3D models, stop-motion animation, board games, graphic novels, pop-up books, artistic interpretations, roller coaster rides through the human body with K’Nex, coding using Scratch, movies, and more. It was a frenzy of glue guns, paint, and green screens slung over walls, but the creativity was electric! Student and teacher reflections depict how depth of understanding and motivation to learn were increased through the personalized, collaborative framework of this project. “This approach impacted their ability to connect learned concepts as they considered the link between new knowledge and the effect it had on their chosen phenomenon,” said classroom teacher and department head Charlsie Vanderrest. In NGSS terms, students transitioned “from learning about to figuring out,” an approach that marries well with the AASL Standards. Our Library Learning Commons has transitioned into a thriving and adaptive space for creativity and collaboration based largely on relationships and building trust with teachers and students alike. Not all projects that we work on are this collaborative. But the feeling of freedom and excitement for creative possibilities that comes as a result of a teacher saying, in so many words, “let’s do this!” is encouraging and liberating. And I strongly believe it improves student outcomes. The AASL Standards keep “students at the center” at a time of rapid technological change, marrying the “qualities of well prepared learners, effective school librarians, and dynamic school libraries.” Focusing on the opportunity for engagement and lasting impact when we collaborate requires that teachers and administrators are willing to take chances in the face of change. In the end, we are modeling for our students how we are all learning together! American Association of School Librarians. 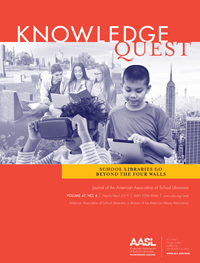 “American Association of School Librarians Standards for the 21st-Century Learner.” Students at the Center Hub, Jobs for the Future, https://studentsatthecenterhub.org/resource/american-association-of-school-librarians-standards-for-the-21st-century-learner/. Accessed 9 July 2018. 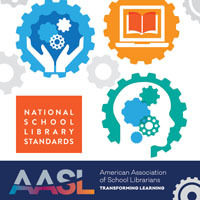 “Common Beliefs.” National School Library Standards, American Association of School Librarians, https://standards.aasl.org/beliefs/. Accessed 9 July 2018. ‹ Choose Privacy Every Day! What an awesome project you were a part of Janine. I’m so proud of you for winning this award. I remember our conversations many years ago about you wanting to go into education. It is your calling my friend. Congratulations and continued best wishes for another exceptional school year!